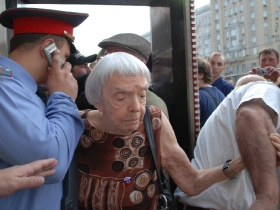 Noted human rights advocate and former Soviet dissident Lyudmila Alexeyeva has announced that she will no longer be able to participate in the Russian opposition’s Strategy 31 rallies in defense of free assembly, Kasparov.ru reports. Speaking Wednesday on Finam-FM radio, the elderly activist said that police routinely create such uncomfortable conditions at the rallies that she has become concerned about her physical safety. At the same time, the activist added that her decision does not mean that she won’t continue to support the Strategy 31 initiative, of which she is a co-organizer. “But I’m going to wear a badge. And tell people that it’s important to preserve tradition, using all my influence and all my opportunities, that’s what I’m going to do,” she said.